Crash pads are an iconic piece of equipment that is used by climbers. While most pads look alike from the outside, there are some pretty significant differences. What distinguishes a good pad from a great one is what’s on the inside. The quality of the foam and the cover material can really affect your hiking experience. Other features such as a closure system, waterproofing, and easy portability add to the attractiveness of a pad. Apart from the foam, there are other important elements to look for in a crash pad. These include the size, thickness, and weight. 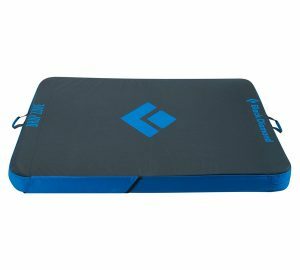 A large-sized pad means more landing surface area, a thicker pad reduces the chances of you bottoming out, and a lightweight pad offers easy portability. Here are our reviews for best crash pads. 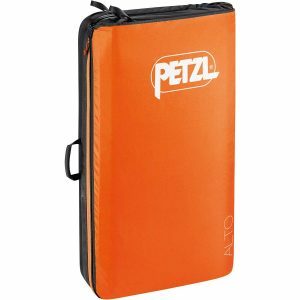 The Petzl Alto is a neat piece of crash pad engineering that is great once you figure out how it works. The Alto’s packaging features a zip that brings the two sides together exposing a very comfortable carry system. Unfolding the zip uncovers a clean landing area free of any straps. What’s more, the mat has Velcro straps that can be used to easily transport the pad without refolding. The pad has a nice dense foam with two layers laminated with a thick layer of padding. The interior composition of the Petzl Alto comprises polyurethane foam that is stiff and offers great shock absorption. Measuring in at 46 x 39 the Alto has a good size to it but did take up a little volume when folded and fitted into the boot of our car. The folded dimensions, however, are comfortable enough for an easy climb to your destination. This is true thanks to the super comfortable carry system. The pad has a sternum strap and Velcro-fastened wide hips belt. You can also stuff some extra items in the zipper with no fear of them falling off. 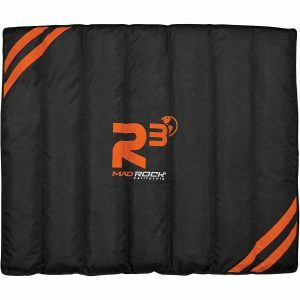 The Mad Rock Mad Pad is a fantastic choice for users who are out for a budget crash pad. For a fraction of the price top tier crash pads, you get a 5-inch thick foam. In addition to this, you also get cool features like lounge straps, a little square carpet, and the ability to connect other Mad Pads. Everything about the Map Pad construction is solid. The pad measures 3 x 4, and it’s a pity it comes in only that one size variant. The pad, however, compensates for this shortcoming with a 5-inch foam that is quite sturdy. The thick foam of the Mad Pad helps in elongating its life. It does tend to soften a bit over time but holds up quite well. The thickness of the pad makes it both durable and versatile for shorter falls. The Mad Pad holds its own when it comes to features. One particular attribute that is very clever is the ability to change into a couch. This does come in handy in creating ideal camping moods in between bouldering sessions. 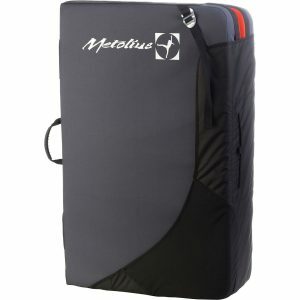 One of the inexpensive crash pads in the market the Metolius Session has a simple, proven design that is coupled with a unique storage flap. This helps to secure belongings during transit. The pad also features an angled design that eliminates dead space that is common with many taco-style pads. The 4-inch sandwich design features a 0.5-inch closed-cell ground layer, a 3-inch open cell foam, and a 1-inch closed top layer. The foam is uniquely layered in a manner that cushions short to high falls. The angled-hybrid hinge helps in preventing sharp rocks from protruding through the hinge. This in effect reduces your likelihood of bottoming out. The Session holds an average amount of gear and is very user-friendly thanks to the strap-flap closure system. The pad also showed little signs of wear after prolonged testing on multiple surfaces and on varying rock types. This continues the good reputation of reliability and durability that Metolius branded pads have had for a long time. The Black Diamond Drop Zone has a hingeless design and a taco style design that is cut for rocks and uneven landing areas. The rubberized coating on the back makes it waterproof, durable, and functional. The Drop Zones padding comprises of a 1-inch top layer of dense closed-cell foam and a bottom layer of 2.5-inches of high compression PU foam. These performed unexpectedly well at cushioning medium-high falls. The foam isn’t too dense and does not soften up quickly. Because of the 3.5-inch thickness however, the Drop Zone is not ideal for high problems. The pad contains a number of features that will please many rock climbers. A center handle that is handy when loading the pad onto your back. Detachable shoulder straps that can be removed when the pad is on the ground to clean the landing area. As with the quality of all Black Diamond gear, the Drop Zone is no different. The company exhibits strong artistry in developing the Drop Zone using high-quality material making it an outstanding outdoor gear despite its 3.5-inches of foam. 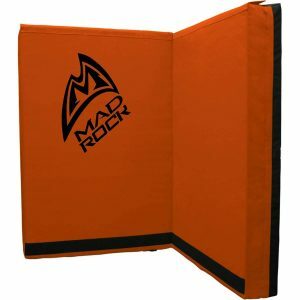 The Mad Rock R3 is an outstanding pad because of many reasons. One, the unique baffled design makes it easy to conform to uneven landings better than most pads. Secondly, it has flap closures similar to the Metolius Session above that allows it to carry gear as well. The R3 has unique padding in the form of shredded EVA foam embedded. The shredded foam makes it flexible and soft but still dense and compact enough to protect you when you fall. Its design is best used to cover rocks and bumpy surfaces and, therefore, plays an important part of your pad collection. The R3 is a superb for packing due to its robust suspension system. The closure flaps do not allow any gear to fall out and with enormous space; this makes this pad the best one we’ve tested for carrying gear. The shoulder straps are well padded to cater for the weighty pad, and the chest strap is a clever addition that ensures compactness during travels. Feature-wise, the R3 is not very rich. It still manages to include a zipper pocket for storing small items. The denier nylon is touted as the most durable in the industry, and the same goes for the R3. Even after months of catching falls the R3 still showed little signs of wear, and we expect the R3 to stand up to years of extensive use. What should you look for when looking to buy a good crash pad? Our comprehensive buyer’s guide will take you through the important aspects you should consider before purchasing a crash pad. There are two main types of mats. The first of the lot is the hinged design with a distinct fold line. Hinged mats make the mat core compact, as there is no dead air when the mat is folded during transportation. While it’s ideal when traveling, the hinged mat has some dead spots where no padding exists. The second type is the taco type of crash pad. This is usually a continuous piece of foam that folds into two to make a taco shape. The biggest upside for this mat is that the ‘no-hinge’ design makes it good for uneven terrain but on the flipside, it doesn’t fold well when traveling. Some newer pads employ the use of a hybrid clamshell. In this crash pad, there is usually a thin layer of foam that continues across the hinge helping to mitigate the problem that is faced by hinged design pads. The foam type and these include open, closed or memory foam. The foam composition refers to many layers of the three foam types will be in use. Foam thickness; manufacturers, may use anywhere from 3.5 – 5 inches for medium padding and 4 – 5 inches for bigger padding. The durability, softness, and stiffness of a crash pad will largely depend on the combination of the three factors above. Generally, stiff and thick forms are the recommended choice because they have a longer lifespan and will support you well in case of big falls. The stiffness of a thick form is what prevents you from a “bottom out” so that you don’t travel all the way during a fall. 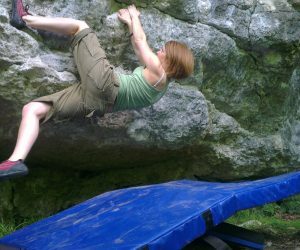 It is true to say that crash pad manufacturers make size a very simple choice for rock climbers. You will mostly find two pad sizes in the market; medium and large. These will occasionally be referred to as half and or full. Regardless of the name, these two come in sizes of 3 x 4 feet and 4 x5 or 4 x 6 feet. The sizes will differ marginally from one manufacturer to another, but generally, you are looking at a big pad and a little one. 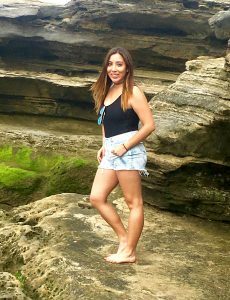 The choice would be easier if you have lots of money at your disposal as you can easily test all sizes and choose one that satisfies your needs. Otherwise, for the rest of us, there has to be some tradeoffs. Big pads are harder hike with because they are awkward to transport in a small car, are more expensive, and are heavier. Smaller pads, on the other hand, tend to be easier to travel with but offer limited landing space. Yes, you can carry two small crash pads, but you will have to make do with the extra luggage and the seam problem. 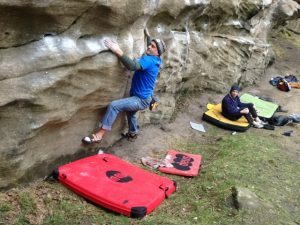 If you go for bouldering quite often, however, it’s prudent that you get a big pad. The crash pad takes quite an amount of blows and hammering from the repeated falls. It is therefore important that you find one with a burly construction, heavy-duty materials, and durable buckles. The two most important materials to be wary of when purchasing a crash pad are the cover and the foam. The cover is the material covering the pad. For enhanced durability go for hardcovers, these are uncomfortable to land on but are have good weather resistance. Soft covers feel nice under your feet and are nice to lounge on but have a problem when it comes to their longevity. The cover material of most pads is made out of Nylon, Cordura Nylon or Velvet. A Velvet upholstery is better for wiping your feet and is more comfortable than Nylon covers. Manufactures like to boast how burly their Nylon covers are but during our testing, we did not find a big difference in the durability of most. Other than the cover, the type foam is another important element to consider. Moving from one boulder to another should not be an uphill task. A good pad should be easy to transport by grabbing the handles on the top and or sides. Handles are also important when loading or offloading your pad from or onto the vehicle. The best pads have burly shoulder straps as well as handles to carry over short distances. Most manufacturers nowadays have moved from plastic to metallic handles, which is a nifty addition. It’s important that the pad you decide to pick has durable suspension systems. Also crucial are the handles that go across the middle for easy pick-ups when walking short distances. Not all pads are made equal as we have come to find out and even pads from the same company can yield different results. Important aspects to look for in a pad include the size of the pad, the carrying system, material, portability, and closure type. These are crucial but can be really confusing when buying your first crash pad. We hope that the information above can go a long way in helping you choose the right pad. Whatever pad you choose to buy, the choices above are all great options. When it comes to crash pads always go for a quality one.